Some viruses use intercellular connections as a means to directly access the cytoplasm of a new host. This allows the virus to bypass host immunity and the complex budding-travel-attachment-entry steps to infect a new cell progeny. These intercellular connections are commonly termed nanotubules, virological synapse or bridging conduits. The extend to which these differently named structures are distinct from one another is unclear. HIV-1 has been shown to use intercellular connections in macrophages and in T-cells . Influenzavirus , Suid herpesvirus-1 and Porcine reproductive and respiratory syndrome virus seems to use intercellular connections as well . 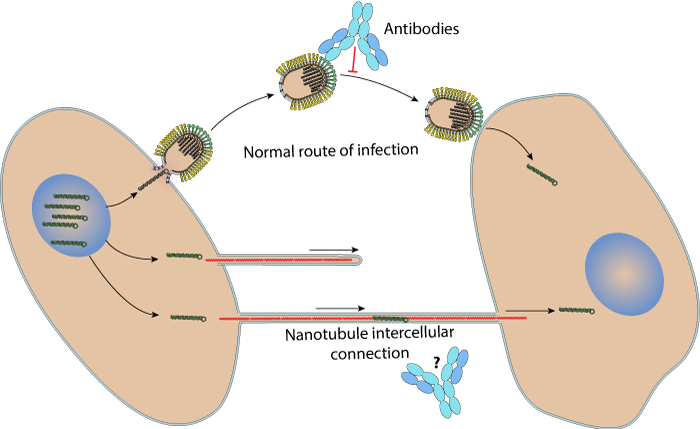 Pseudorabies virus US3-induced tunneling nanotubes contain stabilized microtubules, interact with neighbouring cells via cadherins and allow intercellular molecular communication. Jansens RJJ, Van den Broeck W, De Pelsmaeker S, Lamote JAS, Van Waesberghe C, Couck L, Favoreel HW. J Virol. 2017 Jul 26.